Does anyone know or already have 2014 mirrors fitted to the the earlier model, I have the 2010 STR and think the later mirrors look better? I agree the later ones look better, so I bought some for my 2010, but couldn't seem to make them mount securely and went back to original mirrors. could be my incompetence, could be they are not compatible. Appreciate the info, that was my concern. The switch gear housings that the mirrors mount into are the same item pre and post 2013. The 2013 + mirrors will mount BUT you need the washers, rubbers boots and appropriate bolts ( or something diy similar ) to get them to mount, tighten and adjust properly. 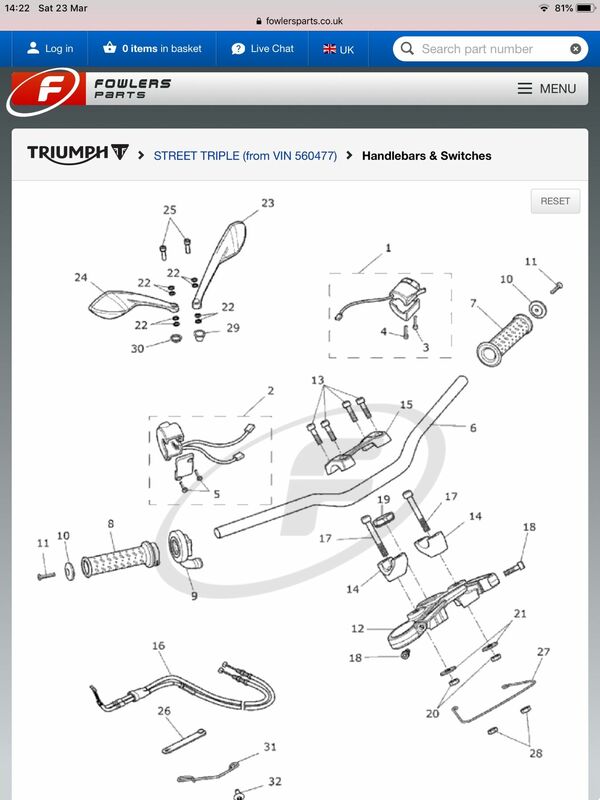 See screen shot from Fowler’s parts page. Ask in Wanted section, someone might have gone bar end mirrors and have mirrors plus bits to sell on - for a price!. I fitted a pair of newer style mirrors to my 2009 STR. Straight swap........but I do remember buying bolts....can't remember why though. But the switchgear etc is fine. In my opinion the pointy mirrors are a bit rubbish. I keep considering putting some (old) Tiger mirrors on which were the same as my 2010 STR and which were perfect for me.